What’s the truth? Well first, it’s unfair to use words like ‘bean counters’ to describe finance people, because beans are not the same as cash. And secondly, from a management perspective, getting hold of good data is really important to understanding how our businesses work. Whether you are running anything from a small marketing agency to a great big corporation or something inbetween, the focus is very much on crunching numbers to get hold of true Business Intelligence. This makes sure we have the right information to make the right choices for running our businesses. Pretty much anyone that leads or owns a business needs to understand where the business is making or losing money. We’ve all seen it in project based environments like software development, creative industries like design, accounting and auditing and just about anywhere where billing is based on the time of knowledge workers spent on projects. It might have seemed like a sensible budget when you agreed it. But when costs spiral out of control, what seemed sensible can make it look like you were crazy. Consequently, in an Agile software development environment, or any other project-based environment where Kanban can be used to visualize the workflow, the answer should be a resounding “Yes”, because it is clear we need to track time. How much work is there left to do? How long will it take to do it? Has it been done properly? I’m sure you’ve been there before – a customer calls you on a Monday morning and wants their project delivered by the next day. Or the string of ‘Oh, and one more thing’ calls or the on and off, stop/start projects. In a world where efficiency is everything, everyone needs - even if they don’t necessarily want to be - Just in Time. Quite simply, in project based environments, the inefficient use of resources like people or materials creates situations of over and under capacity. This makes our businesses uncompetitive, because extra costs or longer project cycles mean we cannot deliver projects on time and on budget. We’ve built Breeze especially for the needs of fast track project environments like Agile software development and incorporated a built-in timer to help people working on any kind of project to track their work. Users simply click the play button to set the clock running to start tracking. If you prefer (or forget to start the timer!) hours can be entered manually by typing. 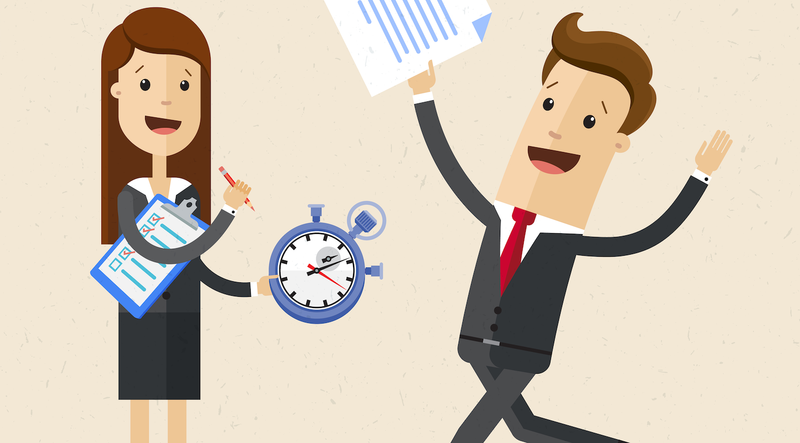 Time can be set as billable or not billable for each separate entry or for the whole project. Breeze saves all the accumulated time in the cloud, even if the browser is closed. It works just great for managing budgets – it’s fully integrated to work hand in hand with project task estimates, so you always know where you are. You can find detailed instruction how to track time in Breeze from our time tracking help page. Lead and cycle times are good metrics but you also need a way to bill your clients. Just add a task to the board and log your hours. Breeze lets you have detailed reporting on demand and it’s easy to generate the time tracking report for your invoices. If you want, you can share this with your clients to let them see where time is going instantly. This might give you the flexibility to change projects on the fly, letting you adjust priorities so the available budget can be spent where it is going to be most effective. Maybe you already have a time tracking solution that you really like, but you want to use Breeze to manage your projects? Well, you don’t have to choose one over the other - you can have the best of both worlds. Breeze has integrations with other leading platforms that provide time tracking and related functionality, including popular online software products like Toggl and Harvest. With Toggl, you simply download the free browser extension from the Chrome store and track the time from Breeze straight into Toggl, and the tracked time is recorded by both. With Harvest, you just configure the integration and the Harvest timer replaces the Breeze built in timer function. Breeze also has integrations with Slack, Github, Bitbucket, GitLab, Zapier, Freshbooks, Groove, Zendesk and more. When you are trying to make your mind up about what you really need in a Kanban project management tool, time tracking is just one of the features that make Breeze a great choice. Breeze is built around a user-friendly Kanban board and brings together what we learned from managing hundreds of projects. To make sure there are really no barriers to turning your project teams on to Breeze and getting them to start using it straight away, we really concentrated on the main goal of making Breeze simple and easy to use. Although developers are technical people, we wanted to make it appeal to as many areas of knowledge working as possible. That’s why Breeze is equally suited to techies like Agile software developers as well as non-technical people like marketers, project managers and accountants. Don’t let simplicity and ease of use fool you into thinking that Breeze is a ‘lite’ product or for lightweight projects. Breeze is simple and a real joy to use, but it still has all the necessary tools for serious project management.